Drewry take our obligations under the various data protection and privacy legislation very seriously. 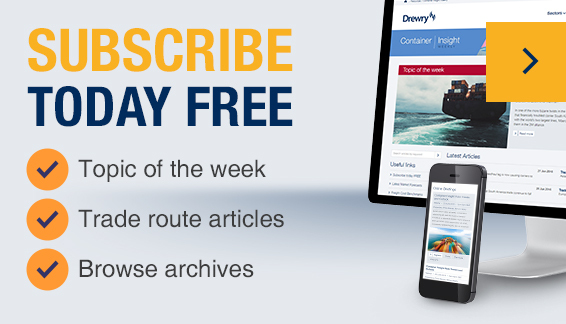 If you have registered on our Website and opted-in to receive Drewry market insights and newsletters we will ensure communications sent to you are relevant and specific to these preferences only. We would only ever keep a copy of your personal data for the purposes of suppressing you from our mailing lists. Drewry is committed to protecting and respecting the confidentiality and privacy of drewry.co.uk subscribers, website registrants and the information entrusted to it. This statement, together with our terms of Website use (TOU) www.drewry.co.uk/terms outlines our privacy and data protection policy and the basis on which any personal data we collect from you, or that you provide to us, will be processed by us. Please read the following carefully to understand our views and practices regarding your personal data and how we will treat it. By visiting our Website (including make orders or posting content) you are accepting and consenting to the practices described in this policy. Any definitions used in this policy have the meaning set out in the TOU, unless otherwise indicated below. Personal details of Users of drewry.co.uk will be collected and processed upon registration to our Website, by registering, completing an order, or if you correspond with us by phone, email or otherwise. The information you give us may include (but not be limited to) your name, address, company name, email address and phone-number. Following registration and only when logged into the Website, we track and record User access to certain key pages such as product pages and the online store or checkout. Steps have been taken to ensure that consistently high standards of data protection are adhered to for all forms of processing mentioned above. THE INFORMATION WE COLLECT FROM YOU IS USED TO ADMINISTER OUR SITE, TO IMPROVE OUR SITE, TO ALLOW YOU TO BENEFIT FROM COMPLIMENTARY SERVICES AND VALUED-ADDED FEATURES OF OUR SITE. For marketing purposes we will only ever contact you by email based on the topics you indicated having an interest in. iii) if we are under a duty to disclose or share your personal data in order to comply with any legal obligation, or to protect the rights, property, or safety of Drewry, our customers or others. All registration and order forms provide Users with a series of choices or "preferences" as to the communications or updates you may receive from Drewry. You have the right to ask us not to process your personal data for marketing purposes. When filling out order or registration forms on drewry.co.uk, Users should indicate whether they are receptive to the use of E-mail to inform them of other Drewry products and/or services. If you are keen to be kept informed of further Drewry products as well as technical/functional developments related to our Website and on-line services then you should tick the e-mail opt-in box. As well as via the www.drewry.co.uk/my-preferences you can also exercise this right to modify your consent preferences at any time by contacting us at enquiries@drewry.co.uk. A cookie is a small file which is placed on the User’s hard drive following a visit to drewry.co.uk. This file subsequently allows the User to move quickly and easily around the Website by keeping a record of your previous visit(s). They help us to improve the Website and to deliver a better and more personalised service. Cookies in use at the Drewry website are not associated with any personal data about that visitor. By using the Website or our online service, you agree that we can place these cookies on your device. It is possible to set your browser to reject certain types of cookies or cookies generally. If you set your browser to reject our cookies, then you will still be able to use the Website but this may impair some of the functionality of your web browser. All personal data are encrypted for transmission over the Internet to a Drewry server. Where we have given you (or where you have chosen) a password which enables you to access certain parts of the Website, you are responsible for keeping this password confidential. Please do not share this password with anyone. The Website, may from time to time contain links to and from other websites. Please note that if you follow a link to any of these websites they will have their own privacy policies. We do not accept any responsibility or liability for these policies and you must check them and consent to their terms before you submit any personal data to them. Under the latest European Data Protection Legislation (GDPR) you the right to access information held about you. Your right of access can be exercised in accordance with this Act. We only hold your data for as long as is necessary or for as long as you have proactively opted for us to do so. We have an audit facility in our systems to determine how recently your data has been updated or used and we use that facility to determine if your data should be modified or removed.